Bed bug infestations follow a regular pattern, from introductions to infestations that can grow large over a period of months. A trained professional can easily find heavy, and even intermediate infestations, but a single bug or a light infestation can be a challenge. 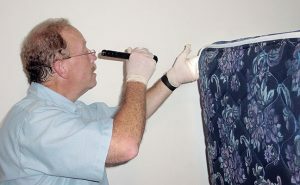 Gary Grossman, a district manager for Rose Pest Solutions, inspects a mattress for bed bugs. Since the great bed bug resurgence began, the problem faced by pest management professionals (PMPs) has been quite simply how best to find them and to kill them. That’s why, for the next few bed bug columns this year, I’d like to focus specifically on inspection. Trained PMPs know where to look and how to identify all the signs of infestation, but single bugs and small infestations can be exceedingly difficult to find. Interceptors will trap bed bugs, but cannot tell you where they came from or how many others are still out there. A well-trained scent detection team can efficiently detect the scent of mild infestations and individual bugs, but the exact source of the scent may be difficult to determine. When each method is used where it excels, bed bug control can be achieved most efficiently. Click here to read the entire article "How to inspect for mild bed bug infestations"
If you think you have discovered signs of a bed bug infestation call Rose Pest Solutions at (877) 740-6787 for a free inspection. Click here for more information on Rose bed bug services.